Provided photo Edison State Community College President Dr. Doreen Larson, second from right, stands with, left to right Grand Commodore Sam Covelli, Gov. Mike DeWine, and Past Grand Commodore Alan Stockmeister, at her induction into the Association of Ohio Commodores. PIQUA — Edison State Community College President Dr. Doreen Larson was inducted into the Association of Ohio Commodores on Dec. 14. The Association of Commodores inducted 15 people from around Ohio during the Annual Winter Induction and General Meeting at The Hilton Columbus Downtown. Dr. Larson was welcomed as the fifth President of Edison State Community College in 2015. She is the first female president of the college since its inception as a technical school in 1973. In 2011, she was inducted into the Mayfield High School Hall of Fame in recognition of her lifelong commitment to increasing access to education for minorities and people with disabilities. The Dayton Business Journal has named her one of the region’s “50 Most Powerful Women” each year for the past four years. The Association of Ohio Commodores is a group of individuals recognized by the governor of Ohio with the state’s most distinguished honor, The Executive Order of the Ohio Commodore. Each year, outstanding Ohioans are recognized for their business accomplishment, acumen, and leadership with the prestigious honor. Gov. James A. Rhoades formed the Association of Ohio Commodores in 1966 for the purpose of assisting the State of Ohio in advancement in all areas contributing to the growth of and development of the state and greater prosperity of its citizens. The association was incorporated under the laws of the State of Ohio in 1971 as a non-profit organization and now its esteemed members are primarily involved with supporting the Office of the Governor and Lieutenant Governor. https://www.tdn-net.com/wp-content/uploads/sites/21/2019/01/web1_LarsonInducted_cmyk.jpgProvided photo Edison State Community College President Dr. Doreen Larson, second from right, stands with, left to right Grand Commodore Sam Covelli, Gov. 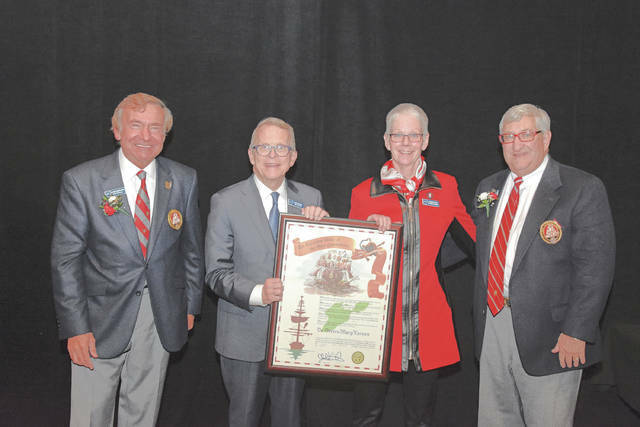 Mike DeWine, and Past Grand Commodore Alan Stockmeister, at her induction into the Association of Ohio Commodores.